There they are – staring at you. Cute lil’ folks in desks or at tables, looking a little fearful but mostly excited, catching side glances from their buddies. You stare back – trying to figure out what you were supposed to be doing with them, completely drawing a blank and your heart beginning the telltale palpitations of increased nervous adrenaline…. For many students, and not just those who live in poverty or suffer from trauma, school is a place of routine, stability, even safety. As excited as you are to be back at school, your students need to see from you a message of love, welcome, and most importantly, that you truly value each and every child. Time spent building community is time extremely well spent. 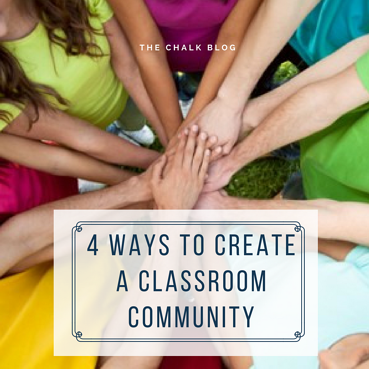 Below are 4 steps you can implement in your classroom to help with your classroom management and help create a sense of community. Introduce morning meeting. You can create a sense of community by consistently holding a morning meeting. Have your students design a poster or anchor chart to display in the classroom. Dedicate the first 30 minutes of each day to this important social-emotional learning and building relationships. Establish rules together. At the beginning of the year, discuss and come to agreement on classroom rules and expectations. Students can and should be reminded of the classroom rules/procedures and practice them daily. Discuss how and why these rules help students stay safe, learn respect, and how the rules help them learn and care about others. You can provide positive affirmations when students follow the classroom rules. Greet each student as they enter the room, everyday. Some teachers stand at the door, some play music, while other write a daily quote on the board. Whatever you decide, do your best to get the day started of in a way that tells your students you care. These small gestures lets each student feel acknowledged and starts the day out on a positive note. Focus on relationships from day one. From the very first day, provide students with opportunities to share their voice and experiences with one another. When we know our students, and our students know each other, we feel safe, supported and respected. The stronger our community, the fewer conflicts we have. When problems do arise, this strong foundation carries us through and helps find real solutions. Community is vital in creating a successful classroom, but it doesn’t just happen. A teacher needs to plan, prepare, and implement procedures and expectations (with the help of students), to consistently make creating a community of learners a priority. Want to explore numerous ways to establish an ongoing social curriculum while creating a strong sense of community in the classroom? Enroll in Course 993: Shaping Respectful, Responsible Learners In Your Classroom and learn the tools and techniques for creating a classroom community that is nurturing, respectful and full of learning.